Not sure just how “ready” or “friendly” some so-called ‘DCC Ready’ or ‘DCC Friendly’ locos are? You are not alone. For more than a decade, I have added dozens of these small micro-controller chips (called DCC decoders) to my engines and learned a thing or two. Perhaps the most important thing I have learned is this: adding a decoder to a "DCC ready" loco is by no means rocket science but it is also not as easy as some manufacturers would have you believe. I thought I would share some of my experience with decoder form factors, drop-in decoders and plug decoders to help de-mystify all of this. I hope you find this article helpful. Before I continue, let’s talk about terminology and some installation basics (ie what’s necessary for a model to even fall into the Ready or Friendly category). In order to install a DCC decoder, the motor must be fully isolated from the track power. As very often the track power is going through the chassis, another way to say it is that the motor must be isolated from the chassis. If this is not the case, installing a DCC decoder might require quite a few modifications, which would make a model of this type neither Ready nor Friendly. This means the locomotive’s motor is isolated from the chassis and from the track power. Unfortunately, Friendly does not mean much more than this. So most likely, in order to install the microchip into your loco, you’ll have to solder the decoder’s wires as best you can, make room for the decoder (by removing some part of the chassis) and modify the connection of the front and back lights (if any exist). Ready can mean a number of things, ranging from very close to the ‘Friendly’ definition (above) to very easy, such as plugging in a NMRA 6-pin (NEM651) decoder. I provide a number of examples (below) to illustrate this range. In the TroveStar database, for each type of locomotive, you will find a DCC section that will provide you with all the necessary information with regards to the DCC readiness level and useful links to DCC manufacturer’s information page. As the title suggests, this means the decoder simply has to be ‘plugged in.’ Some manufacturers also use the terms ’Drop-in’ or ‘Plug-in’ to describe these kinds of decoders. There are two major types of Plug’N’Play decoders: (1) replacement boards and (2) ‘plug’ decoders (with a number of pins). Terms like drop-in and plug-in may lead you to believe that these decoders are in fact easy to use, but this is by far not always the case. We don’t use this ranking in TroveStar; all such decoders will fall into the ‘Ready’ category. DCC decoders come in three different types of form factors: wired, plug and replacement board. Wired decoders are the ‘Swiss-army knife’ type of decoder. They come in multiple sizes and different levels of complexity, which is usually reflected by the number of wires they contain. A minimum of six wires is needed to control the front and back lights – and the motor of course. More wires means more functions can be controlled. Sound decoders obviously require more wires to control the speaker and the cam drive for steam engines. In certain instances, it is better to use Z scale (the smallest size) wired decoders for more ‘difficult’ cases. Decoders with plugs are probably the easiest to install. Similar to wired decoders, the minimum is 6-pin decoder, that is standardized as (European) NEM-651 (NEM 651 Elektrische Schnittstelle - Ausführung Klein (S)) or (North American) NMRA small 6-pin (S-9.1.1 Connectors). The good news about these basic 6-pin decoders is that they are truly universal and offered by many suppliers. I myself have installed several Digitrax DZ125IN in European models that perform perfectly with European control stations. 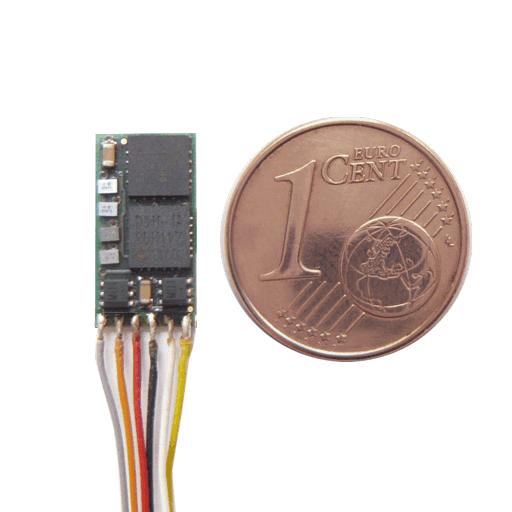 Most of the European models will come with a NEM651 interface. In some cases, there might be some mechanical issues (as the decoder could have the tendency to disconnect due to vibrations when in use) if the female plug on the locomotive is too short. The main problem with plug decoders is the explosion of so-called ‘standards’ to accommodate more complex decoders, such as sound decoders. This is the topic of another debate, and I redirect you to the excellent article by Pierre on his blog: DCC plugs overview (they’ve gone crazy). The replacement board is a form-factor specific to North-American-designed locomotives. The DC-only locomotives are factory-equipped with a control board with front and back lights on its ends. The trouble is that there are many kinds of such boards depending on the type of locomotive, even though manufacturers are endeavoring to reuse (wherever possible) the same board for engines of the same size and nature. If it is possible to modify the DC-boards to wire a decoder on it, it is in fact much easier to replace the full board, though with an average $10 additional cost per decoder compared to plugged versions. I still do not understood the underlying reason behind this North-America design compared to European design with plugged decoders. It might be cheaper to produce than the models with plugged decoders, thus creating an advantage for DC-only modelers compared to DCC ones. I read somewhere that DC remains largely popular over DCC in N scale. Or this is a general arrangement within the industry together with DCC decoder manufacturers. Note that several of the replacement boards come with 2 or 4 additional outputs to the front/back lights, making it possible for skilled modelers to install, for example, ditch lights, rotary beacons, internal lights or (electric) uncouplers; this functionality is however probably used only by a minority of the buyers of these boards. The market for replacement boards is therefore limited to a very small number of manufacturers, compared to wired and plugged decoders, namely Digitrax, TCS, NCE and MRC (sound only). Some North-American manufacturers such as Fox Valley Models have decided to move to plugged decoders, departing as such from the rest of the NA industry. Excellent story. Definitely going to thoroughly read complete article on other sight.